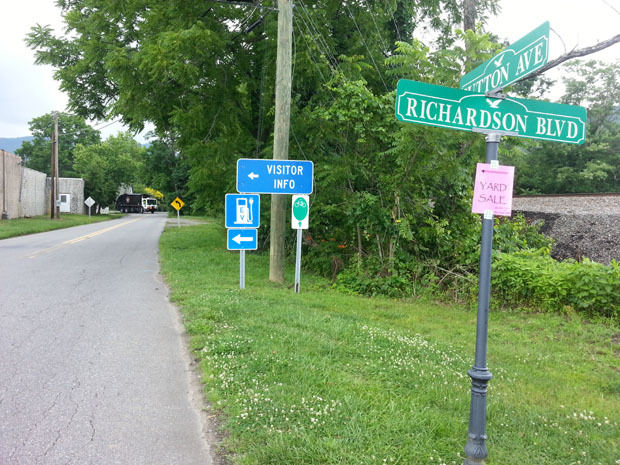 Land-of-Sky Regional Council and the Town of Black Mountain are continuing their efforts to increase awareness of the electric vehicle (EV) charging station in downtown Black Mountain. The charging station, which was installed in late 2011, was a part of a region-wide effort by the Clean Vehicles Coalition, a project of the Land-of-Sky Regional Council, to reduce dependence on foreign petroleum and to promote the use of cleaner, alternative vehicles. Brian Taylor, who is the regional planner of the Land-of-Sky Regional Council, said that they are in the process of installing parking and way-finding signage around the community so that more people are aware of the charging station. He said that adding in the station has not only benefited the environment, but also helped the local economy. “The amount of money added to the local economy far exceeds what the Town has spent in maintaining the electric charger,” Taylor said. Charging the car can take anywhere from one to two hours. 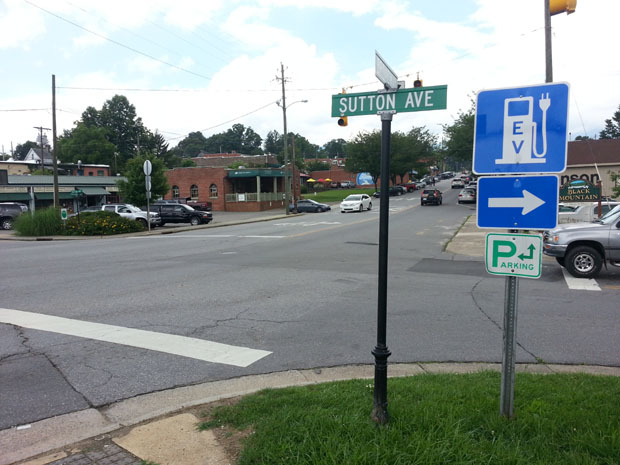 During that time, Taylor said that many electric car owners patronize the stores and restaurants in downtown Black Mountain. Kent Barnes has been converting vehicles to electric power since 2009. 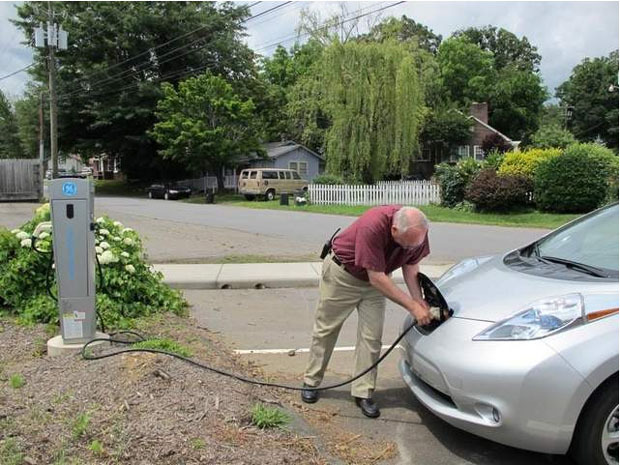 He and his wife, Marnie, purchased an electric car of their own, a Nissan LEAF, in August of 2012. He can press a button on his smart phone from anywhere that will turn on his car’s air conditioning, along with many other amenities that he says can only come with an electric car. Currently, using the car charging station in Black Mountain is free. Taylor said that the use of the station has been growing. 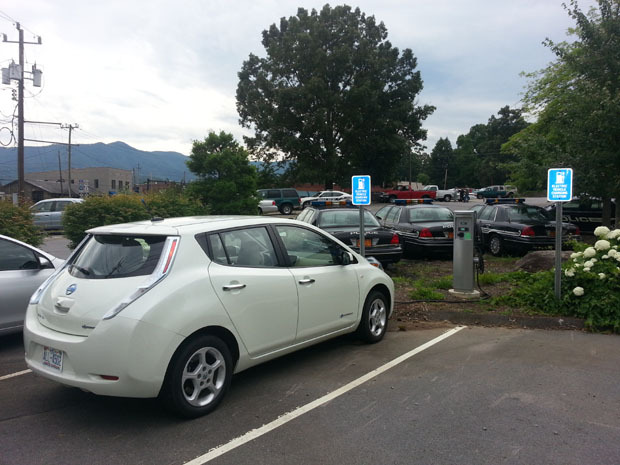 The commission hopes that it will encourage more people to drive electric cars. “It’s made people more aware of the technology,” Taylor said. There are currently two charging stations in the Valley. The other station is at Montreat College. “I definitely don’t miss stopping at the gas station,” Marnie said. One common complaint about electric cars is their inability to travel long distances. However, a report from the U.S. Department of Energy said that the average American’s daily round-trip commute is less than 30 miles. Most electric vehicles have a range of more than 70 miles per charge. Because of these innovations, the prevalence of electric vehicles on the roads is on the rise. The Electric Drive Transportation Association reported that 4,545 Battery Electric Vehicles (BEVs) were sold in May of this year. In May of 2012, that number was 612.